If you think Alaska is taking heat from Outside animal-rights groups about shooting a few wolves, wait until word gets out that we've opened the trapping season on pika. "How can they do that?" you say. "What are they thinking about?" you ask. "What's a pika?" you wonder. That's the same question I had when the state Board of Game voted to open a trapping season on pika in Game Management Units 12 and 20E last week during its meeting in Fairbanks. So I did some research on Alaska's newest furbearer by logging on to the Department of Fish and Game's Wildlife Notebook Series (www.adfg.state. ak.us). Pikas are thought to have originated in Asia, where all but two of the 19 existing species of pika occur. Fossil remains indicate that the pika family is more than 15 million years old and most likely reached North America by crossing the Bering Land Bridge. One of the pika's nicknames is "rock rabbit" for its affinity for living in rocky terrain and the fact it's related to the hare family. Light brown in color, pikas have stocky bodies, short legs and are almost tailless. They are about the size of a large hamster. They tip the scales at a whopping 5 ounces when fully grown, which only takes 40-50 days. 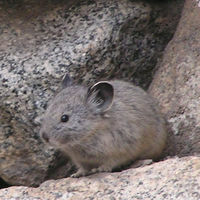 "Smaller than a mountain squirrel but bigger than a vole," is how state wildlife biologist Jeff Gross describes a pika. Pikas form colonies in mountainous terrain, living in old rock slides, talus slopes or around large boulders. They are vegetarians, feeding on the stems and leaves of various grasses, weeds and small shrubs. Pikas are renowned for their "haymaking" ability. The rodents spend much of the summer making haystacks out of grass and twigs that they feed on during the winter. The piles of hay are often partially exposed to sunlight, allowing successive layers of hay to cure. They be cute little industrious buggers but pika are now open game for trappers in Tok. At the request of a local advisory committee, the Alaska Board of Game last week voted to classify pika as a furbearer in Game Management Units 12 and 20E near Tok. That means people can trap them. And since there is no bag limit, they can trap as many as they want. Which begs the question: Why in the world would anyone want to trap a pika? "Historically people have stated they've harvested them before and eaten them," said Gross, the man charged with monitoring the pika population in Units 12 and 20E. "Evidently people have utilized their pelts in the past." Most of Gross' knowledge of pikas comes from conversations with sheep hunters who encounter them while hunting in alpine country. The biologist isn't too worried about the pika population plummeting as a result of opening the trapping season around Tok. "The biggest use I see is sheep hunters taking them for food," said Gross. Which begs another question: What in the world would you shoot them with? Even with a .22 you would probably stand a good chance of blowing a pika to smithereens. For sheep hunters, though, it might not be a bad option for cutting down on weight. Leave the oatmeal, Top Ramen and Lipton noodles at home and eat pika for breakfast, lunch and dinner. And from what I'm told, pika doesn't taste too bad. "They're tasty little devils," said Rita St. Louis, a former wildlife biologist who now works as an administrator for the Department of Fish and Game in Fairbanks. Years ago, St. Louis spent some time trapping pika in the Washington Cascades with her ex-husband for parasite surveys. They used large mousetraps to catch pika and roasted the meat over campfires. "They taste pretty good, like rabbit or squirrel," said St. Louis. "It's a nice, mild-flavored meat." But St. Louis acknowledged, "It takes quite a few pika to make a meal." If animal-rights activists don't think Alaska has sufficient biological evidence to back up its aerial wolf killing program, an often-recited mantra, I shudder to think how they will react to the looming threat against the pika population. After all, nobody has a clue as to how many pika are in Alaska. In fact, there are probably a lot of people out there who don't have a clue we even have pika in Alaska. I can see the full-page ads in USA Today now. "SAVE ALASKA'S PIKAS!" it will read in big bold letters accompanied by a cute, close-up photo of a pika nibbling on a blade of grass. A national campaign will be started to raise awareness of the pika plight in Alaska. Money will pour in to help protect pikas. Tourists will boycott Alaska to protest the killing of pika. A ballot initiative will be launched by a group calling itself Pals of Pika to ban trapping of pika in Alaska. Gov. Frank Murkowski, meanwhile, will vow not to bow to the pika protesters and proclaim that Alaska's pika control program is based on sound science and broad public support, even though most of the public don't have a clue what a pika is, including the governor. News-Miner outdoors editor Tim Mowry can be reached at 459-7587 or tmowry@newsminer.com .